Improving our local Shopping Streets and Town Centres – What progress have we made in Wandsworth? What kind of streets are we talking about? There are five Town Centres in the Borough – Balham, Tooting, Wandsworth , Putney and Clapham Junction. There are also various other streets which are not primarily residential, nor mainly through routes (for example, the northern half of Trinity Road or the A3). These are often streets where people in the borough shop, meet up in cafes, pubs and restaurants, or work. They are the living commercial heart of Wandsworth Borough. They are where so much community and social life takes place. Examples include Northcote Road between Wandsworth and Clapham Commons, Bellevue Road at the southern end of Wandsworth Common, the Lower Richmond and Upper Richmond Roads in Putney, Battersea Park Road and Falcon Road and St John’s Hill in Battersea, Old York Road and Garratt Lane near the Wandsworth gyratory, and the section of Bedford Hill nearest Balham High Road. Each of us can probably think of other instances as well. Bellevue Road at the southern end of Wandsworth Common, as it was just before large numbers of cars in the 1950s. Note the wide pavements and uncluttered roadway. What’s the situation on these streets right now? Some of these roads are managed by Wandsworth Council; others by Transport for London (TfL). Neither authority treats them much differently from other streets. These days they are noisy; choked with traffic and parked vehicles; and polluted. The speed limit remains the standard 30mph. They are dangerous for pedestrians – over half of pedestrian and cyclist casualties in Wandsworth take place on the small minority of roads run by TfL. No steps have been taken to reduce the overwhelming dominance of the motor car. Nor steps taken to get shops to share delivery vehicles in order to reduce the number of big lorries and vans blocking the streets. But things do not have to be this way. The photo of Bellevue Road nearly a century ago shows that our streets used to be different. And with imagination, determination, and cooperation between shopkeepers, local residents and the Council – they could be different again. Of course, motor vehicles are part of our lives today. But as cities like Copenhagen have shown, they do not have to dominate the streetscape. A more people-friendly atmosphere can be created on our local shopping and high streets. Why is it important for us to improve these local shopping streets? These kinds of streets are often where what is called the Place function of the road is at least as important as their Movement function. In other words, they are streets where local residents want to spend time, rather than being primarily to speed motor vehicles through. The evidence shows that most shoppers on these streets get there on foot from nearby streets, or by bus or train. But this is still not a reality many shopkeepers have understood. This is why the reduced car parking charges on Tooting High Street in 2013 have not seen any significant increase in the turnover of local shops. If we want to help local shops and other facilities increase their turnover, then making these streets more attractive, less noisy and less dangerous places where people can spend time lies at the heart of the solution. Just ask traders on Northcote Road, and you will discover what a positive difference the ambience of the street makes to turnover. Also, the more we residents feel these local shopping streets are places we want to go to, the better it is for our health as we get some exercise accessing them on foot or cycle. And of course, the more people inhabit the streets, the more difficult it is for criminals to operate, and so the safer our streets become. Yes, the Council has taken this on board with one or two of our local streets. St John’s Road at Clapham Junction is a good example. Wider, beautifully laid out pavements; allowing only buses and delivery vehicles on most of the road; a patterned carriageway surface that indicates to pedestrians and drivers alike that this is a special space shared equally; a 20mph speed limit to reduce drastically the possibility of casualties; elegant new street benches where people can sit; improved street lighting. All these things have made a huge difference. Old York Road in Wandsworth is another fine example. A pleasant place to spend time. Well connected by public transport. And lots of new places to eat and shop that have sprung up in response. 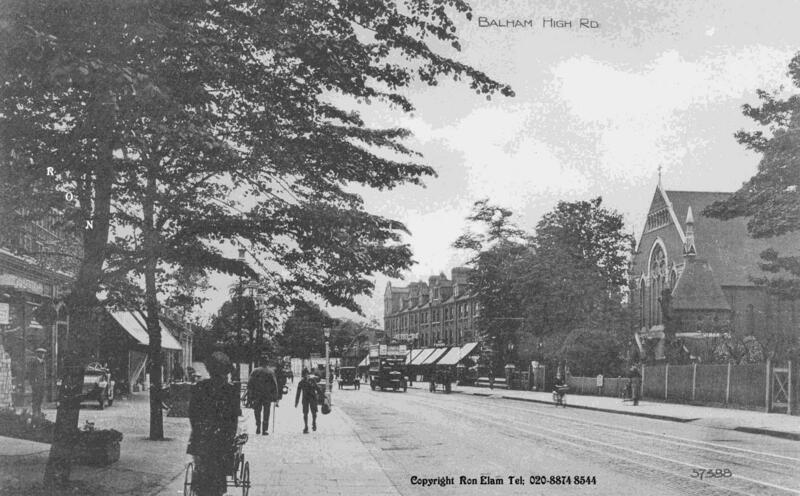 The ‘Balham Boulevard’ idea: Dave Irwin (of the Putney Society and Wandsworth Living Streets) produced practical plans for transforming Putney High Street along these lines. Local campaigners picked up the idea and adapted it for Balham and Tooting. And now we hear that Wandsworth Council and Transport for London have decided to try it out on the wide stretch of Balham High Road between Balham and Tooting Bec Underground stations. We won’t know the details until later this year. But the idea is hopefully to have wider pavements for cafes etc to spill out on to; more trees to provide shade in summer; segregated cycle lanes in order to reduce collisions and casualties; a more attractive carriageway surfacing in order to signal to drivers that they are passing through a special place; and a lower 20mph speed limit. But there are so many more opportunities for action. To take just one example. St John’s Hill is almost there. The Council has treated the entrances where side roads joing St John’s Hill in order to signal to drivers that they are entering a different kind of place. The pavements are wide. Trees are thriving along the whole road. But there is no public seating. The speed limit has not been reduced to 20mph. No measures have been taken to encourage vehicles to use the South Circular (which is just a few yards away and running parallel) instead of St John’s Hill. Putney High Street is one of the most polluted high streets in Wandsworth. Much of the pavement is too narrow. The roadway is clogged with traffic. Stationary delivery vehicles add to the problem. Shopkeepers have done little or nothing to make the street look less tatty, more attractive. No benches exist where local shoppers can rest and chat for a while. There is no greenery. These were all points made to us by local residents when the Putney Society and Wandsworth Living Streets did a questionnaire a year ago. What Putney High Street could look like. 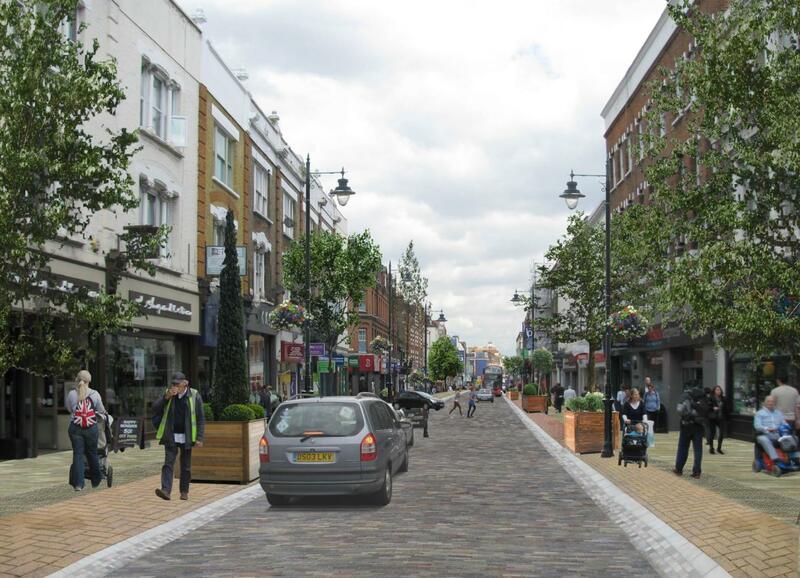 But Putney High Street could be transformed into a place where people on foot would really like to be. Here is a picture of how this street could be transformed – if only the Council could summon up the will to take action. The imminent closure of Putney Bridge for 6 months this year (2014) is an ideal opportunity to trial the kinds of changes which Dave Irwin, a local resident and urban planner, has proposed. Trials are cheap to do. The legal obstacles are minimal. And if Wandsworth Living Streets is proved wrong and shopkeepers find turnover actually falls with the decline in through traffic and the installation of wider pavements, planters filled with greenery, and a lower speed limit – then of course it would be easy and inexpensive to revert the street to what it is like today. But if Dave’s proposals actually worked, as we are confident they would, and residents and shopkeepers enjoyed the ‘new look’ High Street, then it would have lessons for all the other high streets and local shopping streets in the Borough. What are the kinds of changes that could transform our local shopping streets? Reallocate carriageway space as between vehicles, cyclists and pedestrians in favour of more space for pedestrians. This means wider pavements (especially as our population rises and the percentage of residents owning vehicles declines). Alter carriageway surfacing in order to signal to vehicle drivers that they are in a different kind of road space where they can expect more pedestrians. St John’s Road a good example. The beautifully laid coloured brickwork on two substantial sections sends out a signal to drivers, and gives pedestrians a sense that this is primarily ‘their’ street. Make the off-carriageway space more attractive. Encourage businesses to green their premises. Get landlords to beautify the fronts of the first and higher storeys (so often, one has a cheerful groundfloor shop front, with a grotty decaying building on the floor(s) above it). Install planters or, if room, plant more street trees. Encourage hanging baskets. A lovely example can be seen on Northcote Road, SW11, where 3 buildings have been painted, each in a cheerful colour, that brightens up the street. Make the public pavement better to use. Remove clutter. Put in some public seating. Have cycle parking facilities. Reduce noise and road danger by making the speed limit 20mph. This has various advantages. It signals to drivers that they really should be travelling on some other road, or indeed walking or cycling to the street. It may therefore reduce the sheer number of vehicles on this particular road. It also makes the road easier for pedestrians to cross safely. Above all, it helps make the pavement and all its local shops and other facilities a more pleasant place to spend time on. Wandsworth Living Streets supporters are very much people who care deeply about the quality of life for all of us in the Borough. We want to make a difference. We want to work with Wandsworth Councillors, and Transport for London, to bring about changes for the better in our streetscape. We understand there are obstacles. But we approach obstacles not as reasons for doing nothing, but as challenges that a committed Council, working with others, can overcome. Meet your local Ward Councillors. Talk to them about how to improve our local shopping and high streets. Give them this little Update. Put them in touch with Wandsworth Living Streets (see email address below). Make suggestions of which local shopping street in your area might benefit from the kind of treatment suggested here. ← Pedestrian Crossings in Wandsworth – Where have we got to? I wouldn’t suggest that there is no opportunity to improve Putney High St but I do not agree with many of the comments. 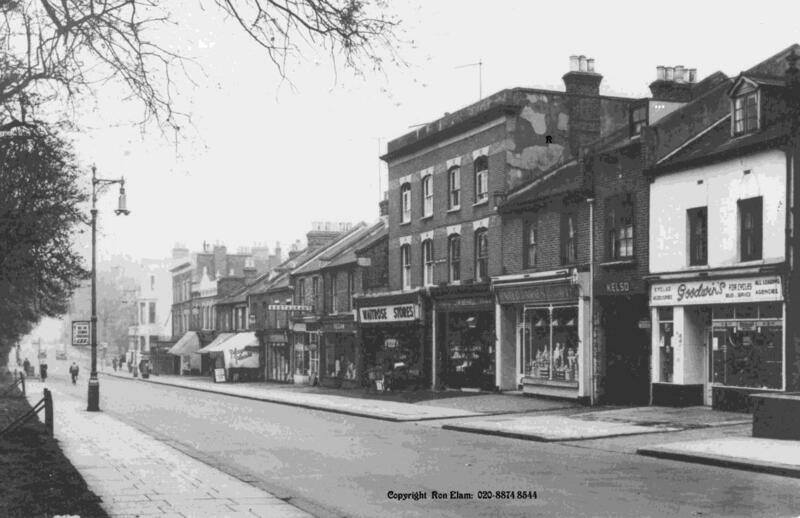 I was intrigued with the comment that the high street was a place to “speed vehicles through” – have you ever tried speeding down Putney High St? No need for a 20mph speed limit, you are luck to get above 10mph. You cannot compare Copenhagen with London. Please take a look at the key metrics of density population and size, they are worlds apart. Putney High St is a major thoroughfare as it is a link one of the few bridges over the river – Northcote Rd is not at the south end of Putney Bridge. Great sentiments which I understand and agree with but i think it is more complicated than you suggest. Happy to discuss further if you want to contact me.